While your car might not have the mess of cables you'll find underneath you desk, it has recently become a home for more technology than it is prepared to handle. Here's how you can keep those stray chargers, audio cables, and whatever else under control so you're not fighting wires while trying to concentrate on the road. My car is only subject to two cables: a 3.5mm stereo audio cable that plugs into my car's auxiliary input and a charger for my iPhone. Nonetheless, these cables would get tangled and confused and sometimes tangled so tightly that I couldn't lift the parking break without sending my phone flying into the back seat. Someday I might drive a nicer car with fancy Bluetooth audio and built-in iPod connectivity, but for now the mess has to be dealt with. Here's how you can keep your car organized and have your cables, too. The most important thing is to have a place to dock your phone, and we've found no better dock than the one you can make out of free office supplies. All of the LA-based Lifehacker team uses this dock because it's really fantastic and only takes about 20-30 minutes to make. I've made three of them, and it's a relaxing activity you can do while you catch up on TV or listen to a a podcast. While the dock was designed to clip on to your air conditioner vent, we found that 1) this isn't possible in every vehicle, and 2) it's not the ideal location if you've got cables running out of your phone or music player. Instead, I've started clipping mine on to the side of the cup holder that sits in between the driver's and passenger's seats. Where you're going to be able to clip this thing is going to depend on the type of car you drive, but I highly recommend this area if it is possible for you. It makes it very easy to grab your phone (or whatever) with your right hand and it keeps the cables from flying everywhere. 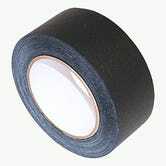 Gaffer's tape is the kind of tape used in the movies for a variety of purposes, one of which is adhering cables to the ground so they don't move around and trip people. It comes in all kinds of colors (so you can match the interior of your car) and you get a lot in every roll. Because it's designed to be strong but eventually removed, it shouldn't cause any damage or leave marks on your car's interior. (At least nothing beyond a light residue that can be cleaned off with a little water.) This makes it a good candidate for binding your cables in place while still allowing them a little flexibility. First, if you have multiple cables, you'll want to bind them into a single cable if they're all going to and from the same location. (My auxiliary input and power port are in the same place, so taping the cables together makes sense.) Just be sure to leave room at the end so the cables have some level of flexibility. Most phones don't have their audio output and charging port in the same area, so you'll need to make sure you allow enough length for each cable to be plugged in comfortable. Once you've got your cables bound you gain a couple of advantages. First, you only have a single cable so it's much easier to manage. Second, because the cable is thicker and bound by thick tape, it loses some of its flexibility and won't tangle as easily. In many cases, you can just stop here because your cable won't get in the way. If you want to take it a step further, however, just tape the bound cable to your car so it doesn't move around too much. Just be sure to leave some flexibility or you won't be able to move your phone once it is plugged in. While taping up your car is not the most attractive solution, if the bound cable isn't enough to solve the problem then binding it further will. 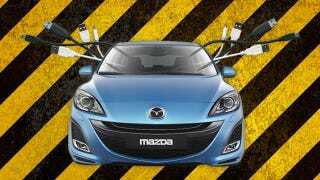 Retractable cables can be enormously useful in a car under the right situations. For example, my auxiliary audio and charging ports both live in a storage compartment between the driver's and passenger's seats. This little box has a small opening for cables to peak through so my phone doesn't have to sit inside when it's plugged in. This is a great opportunity for retractable cables because they can be plugged in and pulled through the opening, but when they retract they don't go all the way back into the box. The opening is too small for the heads of the cables to pass through and so they just get stuck there and wait until they can be used again. As a result, your cables are never messing up your car or really even seen unless they are in use. When you're done using them, just let them retract and there's no need to worry. While this is one of the easiest solutions to the problem, it's not perfect for everyone. Your car may not provide an ideal setup to use retractable cables, and sometimes they can retract unexpectedly when you pick up your device. Give them a try and see how it works for you. Got any other tips on keeping your cables organized in the car? Let's hear 'em in the comments! Photos by PSDGraphics and Alice (Shutterstock).